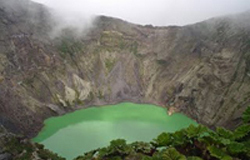 Irazu is Costa Rica's highest volcano and it is from a historical point of view the most active. Irazu had some destructive eruptions between 1917 and 1921. The most famous eruption was in 1963 when President John F. Kennedy was visitng here. A platform let's visitors looking down on the green lake that is three hundred feet deep. The earlier you can get there, the better your chance of getting a view of the crater. Late morning and afternoon clouds obscure the view. Due to the cold and acid emissions, the vegetation is barely hanging on. Wildlife is scant in the area. It can be a very interesting visit to the crater if you visit on a day that the weather is clear all over Costa Rica as you will experience breathtaking views of both coast and scope out the land you plan on visiting during your Costa Rican vacation. The volcano is located just southeast from the San Jose area and can be done in the morning and makes for a great stop on route to the Turrialba area. Many of our Costa Rica family adventures that we take out to the whitewater rafting tours in the Turrialba area will stop by the Irazu crater to make a nice morning of traveling before staying in a hotel to get ready for the next day of rafting. This is also a morning trip for those attending our Spanish school in the village of Sitio de Mata for an optional tour in the area.